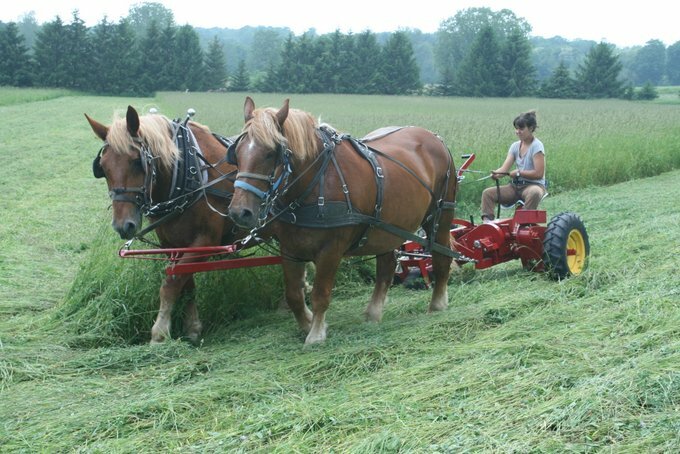 The newest addition to our farm is a fancy new hay mower it has a German made cutting bar that cuts in both directions and doesn’t plug! What a wonderful tool! 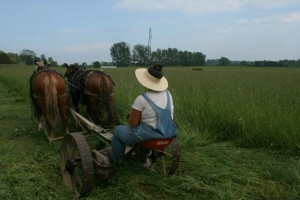 The Amish took the new blade and retrofitted it to be horse drawn. Ken is thrilled and the apprentices, whether they know it, or not are being saved from many tears of frustration. We have some hay in the barn and have more down, waiting to dry. Hopefully, it will be a good hay making year! It is always nice to have new items to add to our CSA shares and we are happy to have the first sugar snap peas, beets, garlic scapes and of course strawberries. Our CSA Working Shares have been coming out and helping with the harvest. We appreciate their help. It is especially nice to have the young members come out and see where their food is grown. Time flies when you’re having fun or you’re farming in the spring! We have been so busy it has been hard to find time to take pictures and make blog entries. The CRAFT Day here on May 14th was well attended by organic farm interns in our CRAFT network from southwestern Ontario. Our granddaughter, Della, was the youngest in attendance. She and her mother have now returned to Oregon, but were here for our first CSA pick-up days. Our CSA fields are filling up with transplants and seeded areas that have come up and are being weeded. We have put row cover on and taken it off too many times. The squash field, with young transplants, has been irrigated and rained on and the plants sprayed with white clay to deter the cucumber beetles. Our hoop houses have supplied the CSA with lettuce, spinach, pac choi, green onions, cilantro, dill and arugula and now have been transformed into tomato and cucumber houses. The outdoor plantings of greens are taking over and we hope to harvest our first Hakueri, summer turnip, on Saturday. The strawberries won’t be ready until the end of June because of the late spring, but we didn’t loose any fruit to late frost!